Leaky Shed Studio: A challenge and a prize! Good morning everyone, Laura here! I hope you are all enjoying your Tuesday....it's supposed to rain here all day so it will be a good day to scrap! from Glitz designs that I really love that had been sitting for a while...some flowers I had and doilies. Then I added some new Leaky Shed Studios chipboard! I cut the Large Medallion into two pieces! perfect for the corners! I also used the Moroccan Border! To alter the Leaky Shed Chipboard I sprayed with Dylusions postbox red and black marble sprays then added a little bit of ranger distress stickles! I also altered my flowers because although I was challenging myself to use some of my stash and they were from my stash and the perfect size - the color did not match! So here is my challenge to you! I want you to create a project using stuff from your stash and some Leaky Shed Studios chipboard and Leaky Shed Studio will send out a prize! AND if you want to earn an extra entry - share your project on our facebook page!!! 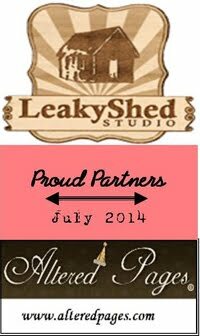 The winner will be announced on the Leaky Shed Studio Facebook Page and the winner has 14 days to claim their prize! Love your layout! Great challenge - I am in!